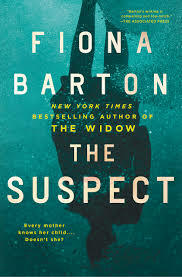 Fiona Barton returns with her series featuring reporter Kate Waters, along with detective Bob Sparkes, in a startling third novel that kept Auntie M up all night to finish it. The Suspect is that good and that compelling. Once it’s started, readers won’t be able to stop. When two girls go missing in Thailand, Bob reaches out to Kate to involve the press. This hits close to home, as Kate’s son Jake dropped out of university two years ago to travel in Thailand and has rarely been heard from since. Kate soon finds herself on the way to Thailand to investigate a fire that involves the girls, but also finds to her surprise and dismay that Jake might have been on the premises at the time. Turning her usual position on its head, Kate soon finds she is the one being hounded by her reporter colleagues, not all well-meaning, as she tries to find her son while investigating what happened to the girls. Things escalate, if that’s possible, from there. The parents of both girls have very different reactions to the situation. Social media posts from one of the girls tracks their trip, but is this the reality? It’s a complicated situation, one that explores the complexities of families,husbands and wives, sons and mothers, and loss and grief, alongside one humdinger of a thriller. No character is left untouched by this story. The inner voices of each character ring true in a moving and realistic way that will bring a catch to your breath. It’s a complicated tour de force of emotions and situations, a beautifully written novel that delves into the psychology of us all. By turning the tables on Kate and involving her own family, the reporter who usually tells other peoples stories must acknowledge that we can’t really know the people we love totally and completely. Highly recommended.